(Click for larger image.) 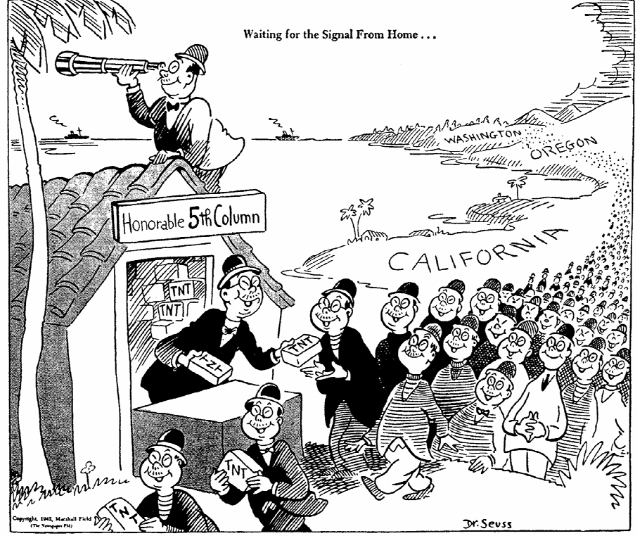 Cartoons such as this suggest that Japanese Americans were traitors, although there were no concerns about German Americans or Italian Americans. Racist sentiments such as this created the Japanese internment camps during WWII. A few years ago I stumbled across Dr. Seuss Goes to War and bought it for my children. (And for me and my friends; one of my friends, a retired University historian, was visiting our home and sat and read it with fascination for quite some time.) It turns out that the beloved Dr. Seuss (a.k.a. Theodore Geisel) produced political cartoons during WWII. Some of them, particularly cartoons about the Japanese, expressed racist sentiments. After the war, Geisel visited Japan and befriended a teacher there. He was so embarrassed by his earlier cartoons that he apologized in a profound way, one that has involved almost all of us. He wrote a new book, and impressed into service a loving, sentimental elephant he had created previously. The new book portrays the elephant struggling and sacrificing greatly to defend the weak. Other of Geisel’s political cartoons, however, dealt with domestic problems. It is fascinating that some of the controversial topics of today were problems 75 years ago: isolationism; support by prominent Americans for totalitarian, anti-democratic despots; discrimination against African Americans; voting rights. And tax and income inequalities. Since the beginning of civilization, the powerful have pushed the cost of government onto the backs of the lower classes. Think about it, what is the King’s tax but a protection racket? I have often wondered what that phrase, “He earned it” means. Two people can put in the same number of hours, make similar sacrifices, but one is blessed with education, personal connections, a good deal of luck – and occasionally, greed and a lack of humanity — and becomes rich. The other does not. If work = income who works harder than, say, a single mom? Forget the supermom, consider the average, everyday single mother who puts in long hours and short sleep just keeping up with food, clothing, shelter, daycare, and school. I am not excluding myself from this criticism. At times I watch other hospital staff struggling to put food on their tables, and am a bit embarrassed at how much doctors make, and at times, how easily. Some people say I earned it. But I never struggled as hard, or as long, or as stressed, as these single moms making $10/hour. And then there are teachers. 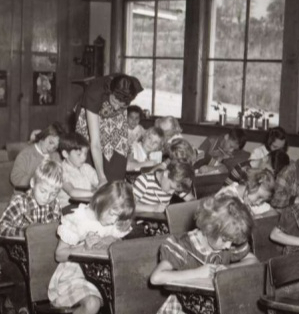 What civil servant, or any employee, works as hard as a dedicated teacher? Too many people think of teaching as a cushy job: only 36 weeks a year, all holidays and weekends off, only 7 hours a day with a daily planning hour thrown in, to do what is clearly a simpleton’s job. The sad thing is, occasionally there is truth to that. I have, from time to time, met or heard of teachers who are gaming the system, doing the absolute minimum and coasting until retirement. Once they are tenured, they just keep their heads down and loaf. But dedicated teachers make sacrifices that are humbling to the rest of us. There are the late nights and weekends grinding through planning lessons and grading papers. Then there are the ‘extra-curriculars’, the meetings, the training sessions, the sponsoring of school clubs and organizations. Beyond the unending hours of work, there is worrying about students, knowing or guessing about their home lives, their fears and desires, and their futures. With that, good teachers are aware that many of the failing students are, in reality, being failed by a system that won’t slow down to take care of them, that shoves them down the assembly line, without any consideration for the human being. I have known dedicated teachers who simply make themselves unavailable from August to May. Their lives are consumed with teaching and taking care of their families, and they have no time for any personal pleasures. Even during summer break they are working on lesson plans for the fall. And yet, we pay our teachers very little. So I wonder, what does it really mean when someone says of a billionaire, “He earned it”? Waiting for the Signal from Home… by Dr. Seuss/Theodore Geisel, courtesy of MrLeesHistoryPlace.com. 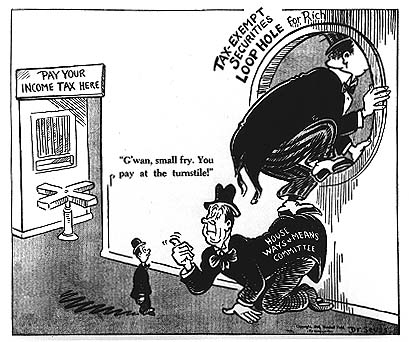 Tax Loopholes for the Rich by Dr. Seuss/Theodore Geisel, courtesy of Ameripics. Teacher Teaching courtesy of SlideShare.net. Spot on about single parent teachers….my mother was one, God bless her soul. The only thing is she was working a second job in the summers to put food on the table AND preparing for the next year. Thanks, Diana. Dedicated teachers are heroes.